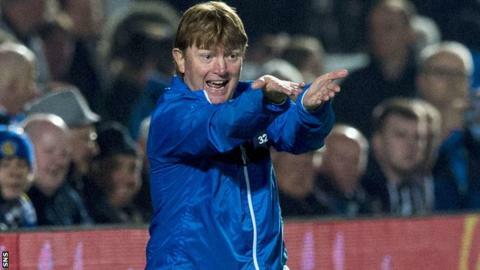 Rangers boss Stuart McCall says his players must show they are worthy of new contracts by proving Thursday's loss to Queen of the South was a blip. Twelve Rangers players are out of contract in the summer. Queens inflicted McCall's first defeat as Rangers manager with a 3-0 win at Palmerston, which followed three straight wins for the Ibrox side. "The contracts are still there to be played for and if you keep performing, go earn yourself a contract," he said. "It does depend what league we're going to be in next season. That would be a definite factor, for all sorts of reasons. "Hopefully, there will be significant money coming into the club but we'll just need to wait and see." McCall's side started the week sitting second in the Scottish Championship but dropped to third after Hibernian beat Dumbarton on Wednesday. Rangers, who have a game in hand, host Raith Rovers on Sunday, when Hibs play city rivals and title winners Hearts and fourth-place Queen of the South take on Falkirk, who are fifth. The teams finishing third and fourth will play off, with the winner meeting the league's runners-up. The winner of that second tie will progress to final, where they will face the second-bottom side in the Premiership. All ties will be played over two legs. "It has an effect on brining people in, re-signing people. "Obviously, you want to be organised and have a forward plan of who might be coming into your club. "I've had agents coming on to me and I've said, 'we'll put that one on the back burner if I'm here or I'll pass it on to whoever's here'. "There's lots of ifs and buts at this moment in time." Striker Kenny Miller is one of the 12 players due to be a free agent in the summer and replied "yup" when asked if he wanted to stay at Ibrox regardless of what division Rangers are in next term. "If it's not to be here then hopefully you will get something elsewhere," the 35-year-old said of the players out of contract. "We seem to have a couple of good performances and then complacency kicks in and we take our foot of the gas. "Might this inconsistency come back to haunt us in the play-offs? It could do, yes."